The festival of colors as many of us know it, is actually an Indian festival called Holi which, whilst celebrated by many around the World, is observed largely by the Hindu faith. The celebration involves the throwing of colored powder over others who are celebrating and after being such a large hit across India, the festival is now celebrated in many countries across the World. 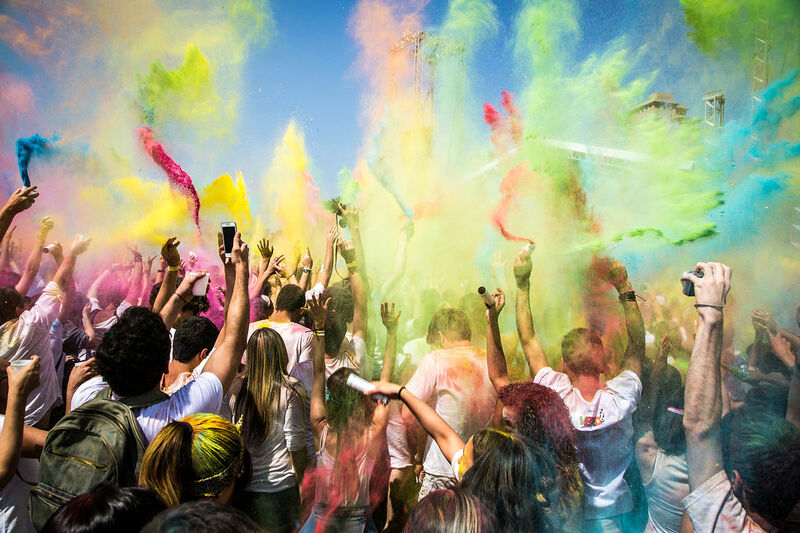 You may have had an experience with the festival of colors but may not know exactly why the festival is celebrated or how the celebrations and traditions came about. Read on to find out more about the festival of Holi. Holy is a festival that takes place between the second and third week of March and coincides with the Phalgun Purnima or full moon each year that signifies the the end of winter and the arrival of spring. The celebrations of the festival are all about fun, pleasure and happiness and are representative of good beating evil or in this case, spring beating winter. The festal lasts for 2 whole days and is celebrated throughout India and Nepal. Most parts of the celebrations that take place over these two days are indicative of happiness, one is encouraged to play, laugh and more importantly to repair broken relationships and to forgive and forget. The origin of the celebrations comes from Prahlada who was a worshipper of Vishnu and the son of Hiranyakashipu, a man given an indestructible boon and believed that he was god-like. Prahlada suffered a cruel life but his faith prevented him from being injured. Prahlada’s aunt tricked him into sitting on a pyre with her but she was wearing a fire-proof cloak, the fire burned and the cloak flew from his aunt and covered the boys body. When his aunt died his father smashed a pillar with his mace and Lord Vishnu appeared and killed him. The next day, when peace was restored, the people covered their faces in the ash of the fire and this is where the traditions of covering each other in color comes from. The traditions kick off with bonfires on the eve of Holi and for weeks beforehand the locals will collect firewood for the bonfires. On top of the bonfires the locals will place an effigy of Holika, who famously tricked Prahalad onto the fire. On the morning of Holi, colored water, chalks and paints are thrown around with careless abandon, all of those celebrating will be covered in color as they sing and dance. The evening of Holi is spent cleaning up and bathing to wash away the colors and this when the ritualistic forgiveness takes place. The celebration is enjoyed all over the World at different times of the year although the only tradition that is really carried out is the throwing of colors, this has less religious connotations and is more about people enjoying themselves and being covered in bright colors.